I have been digging some SDCC 2015 info out there that evokes more questions than answers. From what I can predict from this stuff, there will be Warcraft Movie licensed toys sometime in 2016. That feels more prediction than speculation. It’s coming. Duncan Jones responded today there won’t be a Warcraft Movie trailer showing up in cinemas during the Jurassic World premiere. The rumor first appeared months ago in upcoming trailers list which stated the Warcraft Movie would show up in cinemas tomorrow. Far from his roll of Orgrim Doomhammer and smashing things with a hammer, but Robert Kazinsky can now be seen in the upcoming Frankenstein Code TV series at the FOX channel. However, he does some smashing. Legendary Pictures issued a press release announcing the Warcraft Movie Release Date Moved to June 10, 2016. The intended release date before this change was supposed to be March 11, 2016. This is the second time the release date has been moved. The original date was December 2015, but was changed shortly after the next Star Wars release date was announced — conflicting with Warcraft’s. Speculation: Warcraft Movie Trailer to debut at 2015 SDCC? Speculation-Mode is on, folks. Duncan Jones tweeted he wants to lose some weight for the Comic Con. My conspiracy-theory spider-sense is tingling. As you might remember, Duncan Jones showed off the Warcraft Movie teaser at San Diego Comic Con 2014. That teaser was exclusive to attendees, and recordings were forbidden. To this day, not a single video has appeared online for it. For those wondering what ILM stands for, Industrial Light & Magic (ILM) is an American Academy Award-winning motion picture visual effects company — a division of Lucasfilm. You can browse their past works over at the ILM.com website. Duncan Jones tweeted Ramin Djawadi and himself are working on the Warcraft film’s musical score. Duncan originally announced Ramin’s participation back in January 6. So it’s awesome to hear about progress two months after. If you love the Game of Thrones (HBO) series intro, then you have heard Ramin’s work. Director Duncan Jones has been on fire tweeting short statements on his twitter account about the Warcraft film and about CGI in general, in response to criticism toward CGI as a tool in some films. He must be very excited to see how the Warcraft film is coming along in post-production. What do you think? ManMadeMovies (UK) spotted and got a translation of an interview made by chinese movie-site Mtime to the Warcraft Movie director Duncan Jones. Duncan revealed Ramin Djawadi is scoring the music theme for the Warcraft Movie. Ramin Djawadi is a music composer known for his scoring of Iron Man (2008), Pacific Rim (2013) and Prison Break (2005). This is the first time Duncan Jones has been interviewed about the Warcraft Movie after BlizzCon 2014. In addition, ILM Jeff White (known for Marvel’s Hulk) is visual effects supervisor of the Warcraft Movie along with Bill Westenhofer. Below is a video of one of Ramin’s score for the Game of Thrones (HBO). The Warcraft Movie is slated to premiere in theaters on March 11, 2016. Director Duncan Jones and Legendary Pictures welcomed fans to the Warcraft Movie museum where they displayed armor, weapons and props used during the filming. In addition, fans were able to watch an exclusive Warcraft Movie trailer with actors in action and landscape visuals. Bad news is no one will ever watch the Warcraft Movie trailer online. Our staff member DPerschonok (Naka) watched it, and no one was allowed to take photos nor video. Good thing there is nothing stopping artists from recreating it. Yanmo Zhang — a Blizzard Entertainment freelance artist from China — was invited to BlizzCon 2014 by the video games studio. After drooling over the Warcraft Movie trailer (and watching it three times no less), he decided to use his talent to recreate some of the scenes he watched to share them with fans across the world. Chris Hardwick (@nerdist) interviewed the BlizzCon 2014 Warcraft Movie Presentation panelists: Duncan Jones (Warcraft Movie director), Chris Metzen (Co-producer/writer), Bill Westenhofer (visual effects supervisor), and Rob Kazinsky (Orgrim/actor). We have a full transcript of the panel to share with you. Learn the latest Warcraft Movie updates straight from the source. Use the navigator at the bottom of the page to browse through all 4-pages. Submit transcript corrections here. Blizzplanet member @dperschonok took photos of the Warcraft Movie museum room set up at BlizzCon 2014 for all fans’ delight. Duncan Jones and Legendary Pictures filled the room with props, armor and weapons used in the Warcraft Movie. 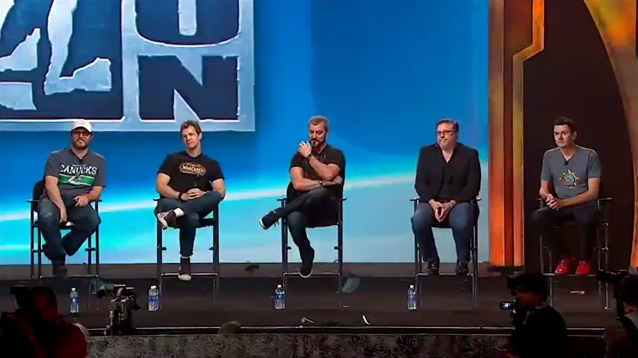 The Warcraft Movie Presentation Panel at BlizzCon 2014 revealed the roles of many actors. Stay tuned for the panel transcript sometime during the next couple of weeks. Duncan Jones tweeted this humorous photo of a trio of geniuses looking at some visual effect photos of a naked orc. The BlizzCon 2014 schedule shows the Warcraft Movie Presentation panel will happen on Friday, November 7th between 2:15 PM – 3:15 PM PST. It is very likely a movie preview is shown. Those who won’t attend BlizzCon may still purchase the virtual ticket to watch online. If you missed the movie presentation panel last year, we have a full transcript. Check out other panel transcripts in our BlizzCon 2013 Panel Transcripts Archive. Legendary Pictures posted a couple of photos showing the Dark Portal concept art illustrated for the Warcraft Movie. Photos have begun to flood the social networks showing Duncan Jones signing Warcraft Movie posters at the Blizzard Entertainment booth# 115. Blizzplanet staff member Danny (@dperschonok) was among the lucky fans to get one of the 200 tickets for this signing event. He’s extremely happy to have gotten a Warcraft Movie poster signed by Duncan Jones. These photos from the Legendary Entertainment booth show several weapons used in the Warcraft Movie by director Duncan Jones. More pictures soon. Danny (Dperschonok) is at San Diego Comic Con. Legendary Pictures has revealed the official Warcraft movie logo in the eve of San Diego Comic Con. Those heading down to SDCC should grab their tickets early at 11am at the Blizzard booth # 115 (Hall A). Only 200 tickets will be given. Those lucky ones to get a ticket will be able to take the line for the Duncan Jones signing. Blizzplanet staff member @dperschonok (Naka) will be at the Blizzard panel and the Warcraft Movie panel. Make sure to check us back for any updates. We’ll have video and HD photos. Duncan Jones Signing—Saturday, July 26, 2 p.m.
Duncan Jones, director of Legendary Pictures’ upcoming Warcraft movie, will be at our booth signing autographs for 200 lucky attendees. In order to get a chance to be included in the signing, stop by our Blizzard booth at 11 a.m. on Saturday to receive a ticket to participate. These tickets are being given on a first-come, first-serve basis, so make sure to plan a stop at our booth early. But wait, there’s more! On Friday, during #LootCrazy redemption between 5 p.m. and 7 p.m., we will be giving away one golden ticket as a prize. This rare treasure will grant the holder the chance to have a one-on-one chat with Duncan Jones! Legendary Pictures presents a panel featuring their upcoming slate of highly anticipated films. IGN interviewed X-Men: The Last Stand actor Ben Foster who revealed he plays the role of Medivh the Last Guardian in the Warcraft Movie. Foster also had the chance to see some test footage of motion-capture and mentions while Medivh doesn’t have any motion-capture, there are characters and creatures in his proximity onscreen that do use motion-capture.